These glory holes are praised by Henry Halem in Glass Notes. The brick lining increases durability and acts as thermal mass. This results in more even heating and steadier interior temperatures as the doors are opened and closed. 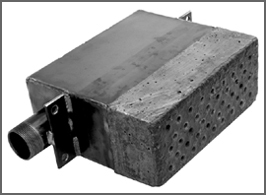 There is also a heat retention lip in the front that establishes a heat line and reflects heat back in to the inside. We build these in a heavy 10 g steel shell on a 2” square steel tube stand. 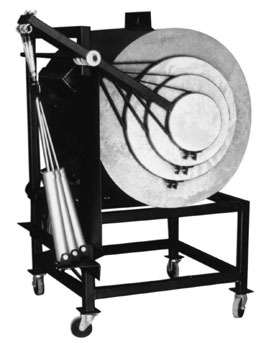 The drum has a 2.5” 2800° degree brick lining and is insulated with 3” of 12 lb./sf insulating fiber. Glory holes are delivered with levelers; casters are optional. There are three door options: hinged barn doors, pneumatic and sliding. Door opening sizes are made per your specifications. Doors are also available with staggered openings. 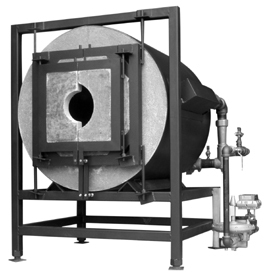 We offer an attached pipe warmer. The pipe warmer uses heat from the glory hole and acts as a flue reducing sting out from the front. Our glory holes are available in any size in 2” increments starting at 6”. The glory size refers to the opening in the front with all the doors open. Depths are as listed. As with all our equipment, if you don’t see what you want, don’t hesitate to call. We are always happy to make changes to meet your needs. Prices do not include crating or shipping costs. Mounted onto glory hole. Uses heat from the glory hole & acts as a flue. We like to build glory holes with Pine Ridge Enterprises whisper quiet ribbon burners. There is no need to shout over these burners! Extremely rugged, the burners are low velocity and heat very evenly. Other burners are available as well. All burners require a mixer; we offer two options. The most common is the Alfred style mixing tee. This simple setup has very little pressure drop and the burner output is adjusted with a needle valve. We also offer Pyronics flange mixing tee's. This mixer is by far the best proportioning mixer on the market. It is easily adjustable; there are no venturi tubes to change, making it the ideal mixer for a broad range of applications. For more glory hole combustion components please see our Combustion Control & Safety Solutions page. These burners have the ribbon design which provides even heating of the glory hole. They are also very quiet and extremely rugged. Average pricing listed—call for a specific quote. Includes Alfred style mixer, needle valve, ball valve, and two butterfly valves. Includes Pyronics flange mixing tee, ratio regulator, regulator ball valve, and two needle valves. National Fire Protection Agency (NFPA) guidelines do not require a flame safety system on burners if they are not operated continually as long as there is a qualified operator monitoring the flame. We recommend using at least a manual reset solenoid valve on the gas and an air switch to shut off gas if the electricity goes out or the blower fails. In some instances such as schools and studios that are open to the public or in urban areas, a flame safety system may be required. In these cases, the flame safety system is very similar to that of a furnace. The difference is that the flame safety for a glory hole uses a pilot burner that is monitored by the U.V. sensor rather than the U.V. sensor monitoring the main burner. Stamped engineer drawings are available. Includes all parts necessary to meet NFPA guidelines including control panel, U.V. sensor, dual solenoid valve, hi/low gas pressure switch, air switch, high temperature limit control, thermocouple, ignition transformer, pilot burner, pilot mixer and pilot solenoids.